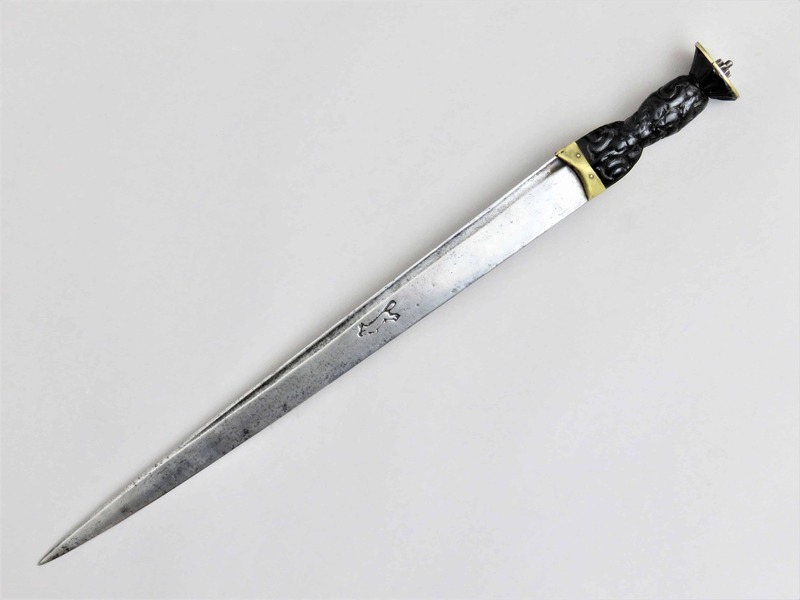 A scarce and attractive English Officers’ sword, with iron hilt and golden coat, dating to the period shortly after the Restoration of the Monarchy in 1660. 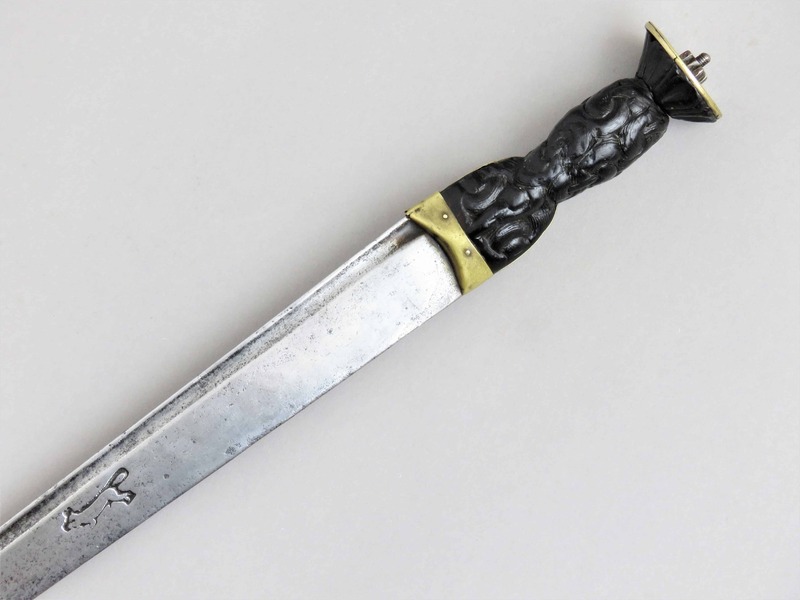 The slender blade carries the Blackamoor head mark at the forte which was assigned by the London Cutlers’ Company to Abraham Smith on 25th March 1664. The original grip is handsomely bound with alternate twists of brass wire and woven “Turks Heads” top and bottom. 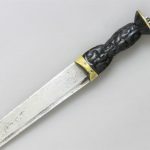 The remarkable feature is the survival of nearly all of the gilt to the hilt which has retained its appealing oval shape in undamaged condition. 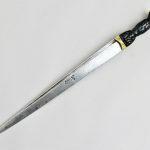 The hilt is made up of a cross guard which extends to the rear to form a wristguard from a downward drooping quillon with a swollen terminal, whilst at the front, a main knuckle bow extends to secure itself into an aperture located at the front lower part of the pommel. Either side of the cross a solid shell guard is mounted with thickened moulded borders. To the upper edge of the front of each shell rim secondary scrolled swept guard bars are attached, three to the outside of the guard and two to the inside, which rise separately to join the main knuckle bow. 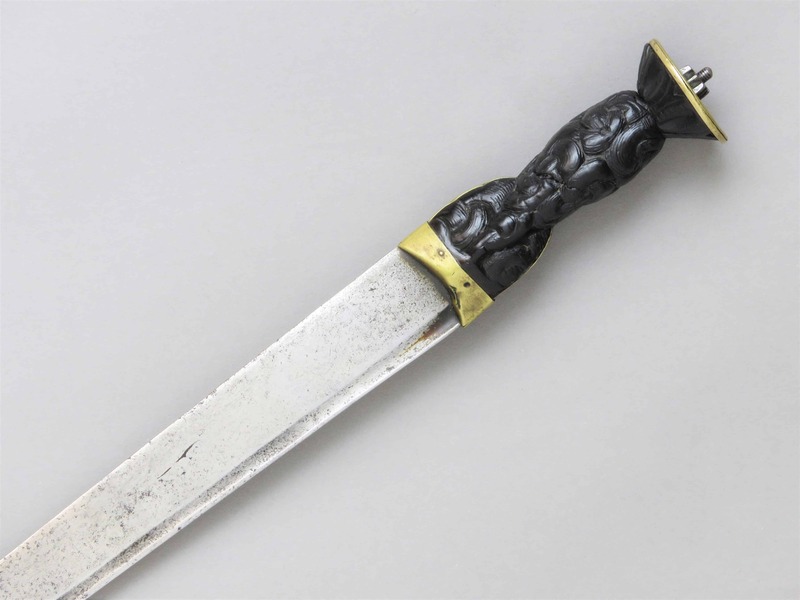 The style of these bars and terminals is reminiscent of earlier English “Mortuary” type hilts. The oval shaped pommel has an integral button and flared neck beneath. 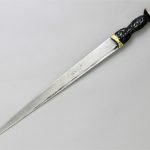 The blade is single edged, becoming double edged towards the point, and has a short ricasso plus a long shallow fuller. The armourers mark is present on both sides. 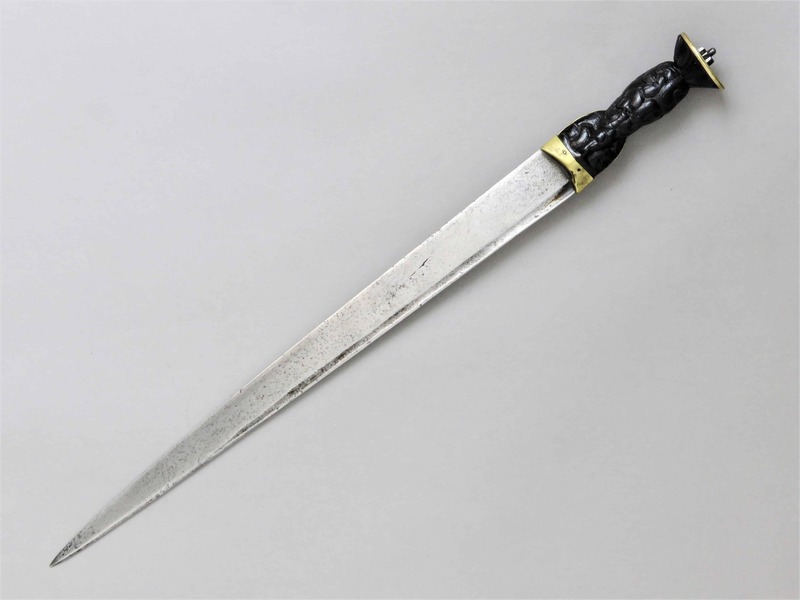 The overall length is just under 38 inches (96 cm) and the blade is just under 32 inches (80 cm). 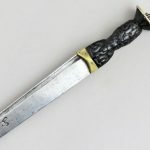 The sword is in fine condition with an old nick towards the end of the blade.